Home News What Is The Largest Airline By Number Of Passengers In Each State? What Is The Largest Airline By Number Of Passengers In Each State? What’s the largest airline operating in each state? the answer may not be as clear when you take a look at how many passengers the airlines usually move in and out of the state. I was actually quite surprised by some of the numbers and the biggest carriers are. 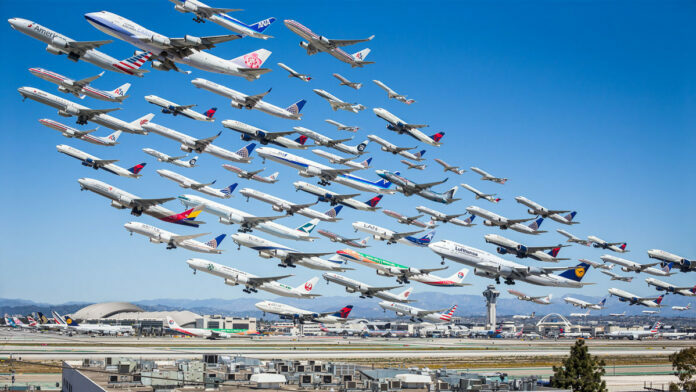 As the number of airlines keeps shrinking we get focused in on airlines consolidating their presence to certain territories of the states. In the below infographic passenger numbers were compiled from one year of data and each airline was awarded a state based on the volume of traffic that went in and out of the hubs. This not only included passengers arriving and departing but also counted passengers connecting onto further destinations. All numbers gathered are the statistics officially given to the Bureau of Transportation Statistics between July 2016 and June of 2017 giving one full year of data to work from. Some of the major airlines in each state is quite surprising and others you would find very obvious. For example, as a resident of the northwest I know everyone flies Alaska Airlines and that aligns with the data of seeing all the northwest states plus Alaska dominated by the airline. The same goes with American Airlines, their main hub which dominates Texas is clearly shown as well as their North Carolina hub which sticks out. Overall I was quite impressed by Delta’s footprint, they dominate the states (right after Southwest) with the number that they serve showing a steep distraction from the other legacy carriers mottos on focusing on hub cities. Unlike United and American who focus on specific regions you see both Delta and Southwest dominate from east to west coast serving as many states as they can. 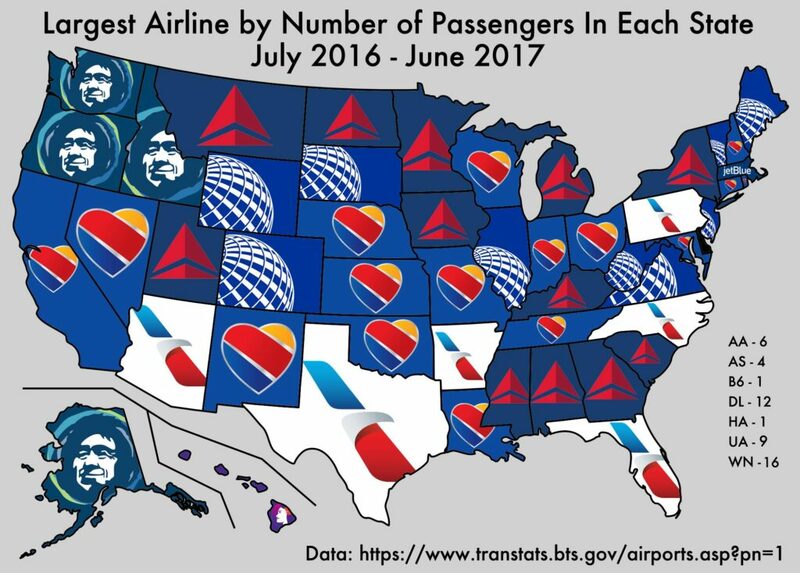 Of course we can’t end this without talking about Southwest who just dominates the passenger travel field by picking up a whopping 16 states where they move more people than the legacy carriers. Rather than any of the other flight models that the legacy or regional carriers have, Southwest is a different breed of airline where they make multiple stops along their journey across the states with only some select routes being nonstop. It’s interesting to see how these airlines play a huge part where they are more prominent. For me being in a primarily Alaska Airlines region you see a lot of advertisements for the airline but you rarely see anything for American or United who both have a much smaller footprint in the Seattle-area. There is however one exception to my story, Delta Airlines has been aggressively trying to take over Seattle as a major international hub and you see both them and Alaska Airlines butting heads constantly with rivaling advertisements. What airline do you prefer in your area?